Patrick grew up in Mesa, Arizona and graduated from Mt. View High School. He did four years of active duty in the US navy as a hospital corpsman. 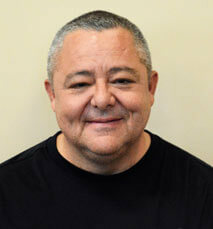 After departing the navy, he earned his bachelor degree in Exercise Science from Arizona State University in 1996. In that same year, he received his certified Athletic Trainer license. He worked all the major sports at ASU from football and softball to swimming. He obtained his PTA degree from Gateway Community College in 2010. He is currently the PTA/ATC at Kempton PT. He also does outreach athletes training to smaller schools like Superior and Globe. He enjoys fishing in his spare time.